We are consistently searching for and recruiting top talent in the service industry. Prospective applicants undergo a rigorous pre-employment screening process. Once a qualified applicant is recognized and accepts an offer of employment, they then begin a detailed training program to instill our vision, policies, and protocols. This helps us to ensure all our clients receive the highest level of service, rivaling that of worldwide leaders. We call this "The Commonwealth Way", and it is stressed to each employee upon hire and reconfirmed through continuous training throughout an employee's tenure within our firm. Chauffeurs for Commonwealth Worldwide are the face of our company. We seek only career professional drivers who have the ability to adapt to different situations at a moment's notice to make sure the client is delighted at every opportunity unlike some companies, we empower our chauffeurs to make these decisions whenever necessary. Our drivers treat each and every assignment as if it's the only job they'll have all day. Drivers undergo rigorous screening including drivers' record checks, state and federal background checks, pre-employment drug screens, and written testing on local knowledge before being offered a position at Commonwealth. Once hired, chauffeurs must attend a 40-hour initial training program consisting of both class time and on road exercises. Chauffeurs must complete all aspects of the training curriculum and pass an exit exam before being allowed to provide service for a Commonwealth client. Commonwealth believes in only hiring full time employee-based chauffeurs - we do not utilize independent contractor/operators. We feel this is the only way to continuously monitor performance throughout employment and maintain accuracy ratings that regularly outperform the industry standard. Once a chauffeur has completed the training program, it doesn't end there. Drivers' performances are reviewed on a quarterly basis as a standard practice. Training sessions continue throughout a Chauffeurs employment with Commonwealth Worldwide. When our clients call us, we answer! We have a live, 24 hour, U.S based call center, operating seven days a week every dayof the year. New call center employees go through an extensive 80-hour initial training program focused on reservation software programs, telephone systems, and intensive customer service techniques. 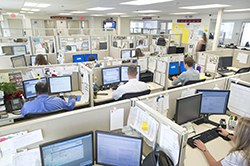 Once working in the call center, employees are evaluated and monitored for customer service. All calls are recorded in order to provide feedback and coaching on different techniques. Several times each month, supervisors review recorded calls and e-mail correspondences with call center reps to ensure the highest levels of service are maintained. There is continuous training on a quarterly basis for all call center reps focused on any software updates that are put in place, as well as refresher training. Commonwealth invests heavily in IT. We are constantly improving our service levels through continuous updates to our reservation system, flight-tracking software, GPS monitoring, and keeping our staff up to date on these improvements through thorough training. From New York City to any small town in the U.S., we know that Commonwealth reliable services will help get our clients to their meetings in a professional and timely manner.